Of Milk Per Day-Visitors Welcome -T. B. Tested. Rutherford county has one of the best, most modern and sanitary dairies in the State at Cliffside in the Lakeview Dairy. It is owned by the Cliffside Mills Company. Mr. Walter H. Haynes is general manager. It is equal to any dairy in the whole South-land in quality of milk, sanitation and efficiency. It was started in the lifetime of the founder of Cliffside, Mr. Raleigh R. Haynes. The milk is all strained through eight different cloths. Everything possible is done to make it clean and sanitary. Screens and boiled sanitary vessels are used. About 100 gallons of milk per day is realized from about 26 milk cows. This is used by the people of Cliffside, Avondale and vicinity. It is delivered to them daily at 60c per gallon. Most of the larger towns pay 80 and 90c per gallon, for good dairy milk. The drug stores at Cliffside and Avondale sell half pint bottles of the milk. The former uses on an average of about 100 half pint bottles per day while Avondale drug store uses about 50 bottles per day. The dairy has a big churn to convert the milk into butter, if they happen to have more milk than is used, which is a rare thing. 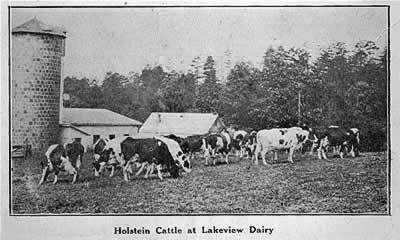 Holstein cattle are used in the dairy altogether. They are all registered and graded. Twelve of the finest cows were bought from a Virginia sale. A textile college graduate is employed by the authorities to test cows, milk and oversee the cattle. Listen to this record: One of the best cows is named Rosni Vale Dekol. Her record when two years old was 1550 pounds of milk and 636 pounds of butter. In 1917, daughters of her sire averaged as 2 year olds second highest of any sire in the United States. All milk cows have been Government tested by the U. S. Bureau of Animal Industry. No new cows enter the dairy without first having the Government T. B. test. The stables are clean, warm and comfortable. Here many farmers can get a lesson that will be very valuable to them. The dairy has about 50 head of cattle. It often has bulls that weigh 1800 pounds. Visitors are always welcome and they consider it a pleasure to show you through. It will pay many of’ our farmers and stock raisers to make a trip to Cliffside to see this dairy and get lessons from it. The dairy has a Dodge delivery truck that makes daily rounds. They have several milk cows worth $500 and one that would easily sell for $625. A steam sterilizer for the cans and a bottler that will fill four bottles at one time, are valuable parts of the dairy equipment.